You might remember when I mention an ornament exchange on my blog back in November. My ornament came a little late, but better late than never right. I love the ornament I received! It's fits right into the wooden ornament theme I have going on. Plus it will definitely remind me of the kind of Christmas we had this year. If your reading thanks Angela!!! This weekend I made French Toast using the recipe from my new cookbook Deceptively Delicious and it turned out great. I went to the store with my mom the day before and picked up tons of healthily stuff so I made the French Toast with whole wheat bread and yam puree and I sprinkled milled flax seed on them. The powdered sugar covers up the fact that they look a little more grainy than normal. They really tasted great though. You could not taste the yams at all. Owen actually asked for more and I think he had more than me or Michael did. Tonight I made my normal recipe for Tuna Casserole, but I added Butternut Squash puree and it tasted the same and he ate a nice portion of it. I'm so glad that we are finally getting this kid to eat some veggies even if we have to be a little sneaky about it. When my Aunt and Uncle were out here from Wyoming during the summer they bought Owen these Tigger Crocs at the mall. Owen didn't have any Crocs and these were the smallest ones she could find. They are still a little big on him, but I'm so surprised at how many things they actually match with. I guess we like Owen in orange and brown! I think they are so cute and Owen really likes them too. Thanks Aunt Linda!!! Jack's third tooth popped through today. It's his right top front tooth. I guess we won't have another baby that looks like a hippo. As promised here is a picture of the personalized step stools that my mom and dad got Owen and Jack. They are super cute. The letters are really thick and come out like puzzle pieces plus the legs are angled so it's really hard for them to tip over. Owen loves lugging them around and he says, "knee" which to him means 'name'. Here they are wearing their union suits. They are so adorable!!! My brother and his family weren't able to come to Christmas at my mom and dad's house on Christmas day so we had a make-up Christmas on Sunday instead. It was really nice. We just hung out and talked for a while and waited for Owen to wake up from his nap. Then we opened presents and had cocoa or apple cider and talked for a bit more and then we all headed home. Ryan and Kim both got some really cool sculptures from mom and dad. Jack got a Backyardians guitar which is awesome because Owen already has an Elmo one so now they can jam together. Owen got a cool Baby Einstein submarine toy to take the bath and Michael and I got the game Catch Phrase to play with our friends. It's another week of freeing myself of the thing I most certainly do not do! 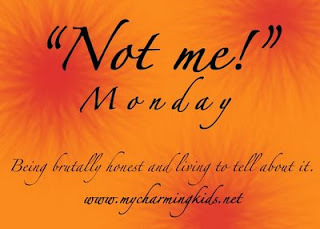 MckMama is taking a break from Not Me Monday this week, but you can check out her blog anyway and see what's going on in her life. 1. I did not change Jack's diaper this week on a blanket in the living room only to find that he had pooped everywhere and then strip him down right then and there so I could bathe him. I also did not then get peed on while I was waiting for the sink to fill up for his bath. He most certainly would have been finished emptying both his bladder and bowels prior to me holding his naked self in the kitchen. 2. Speaking of poop I most certainly would have not changed yet another one of Jack's diapers and discover there was poo in it and set said poopy diaper on the floor and notice later that the poop that was in the diaper had rolled out onto the floor. I also did not just take a baby wipe and mop up the floor...of course I would have ran and got the actually mop and Lysol and cleaned the floor properly because I have tons of free time on my hands. 3. Speaking of cleaning I most certainly am not one of those mothers that licks their baby's face when a baby wipe or washcloth is not conveniently within reach. That would be way too gross especially since said face was covered with leftover baby banacado...ewww!!! 4. Speaking of food I would absolutely not sneak vegetables puree into our food because Owen won't eat them...ever. That would be too devious of me. Okay let's hear what you didn't do this last week!!! The day after Michael bought me my new ring he gave me another present. He had wrapped up our wedding video so we could watch it together. I don't like watching or hearing myself on video so I think I've only watched it once before. We waited until the boys went to bed and then snuggled together to watch it. It was actually really fun and we exchanged rings and danced together in our bedroom. Ahhhhh!!!!!!! The next day Michael had to postpone his plans because of the snow so instead I got a "Univeral Gift Card" ($40). He thought he'd have a back up plan just in case the weather didn't cooperate. He sure thought of everything. I told him it kind of fit into the timeline he had going because after our wedding we opened cards with money in them!!! The next day Michael gave me another gift which was a picture of our condo that we bought when we were just 21. We drove over there after I cleaned my mom's house and visited with one of our old neighbors. It was fun to take that walk down memory lane. The next day I got another gift which was a picture of Swedish hospital where our two beautiful boys were born at. Michael wanted to drive up there to see our doctor and see if they would let us peek in on the room where I stayed, but I figured they would be too busy to let us do that and the weather wasn't that nice. So we decided to celebrate our boys by just staying home all day and spending time with them. We also made cookies and that was really nice. Since we were celebrating the boys Michael also gave me the cookbook Deceptively Delicious by Jessica Seinfeld. I've been wanting it for a while now since Owen won't eat vegetables. I'm so excited to try out the recipes. Hopefully he won't notice that there are vegetable purees mixed into his food. On Christmas Eve I got a bunch of fun stuff that I can use to make cards. One of the presents was a mirror image stamp so I can reverse the direction a stamp faces. It's so cool! I didn't even know they made such a thing. On Christmas Day I got my 'future' gift which is a 2-night stay at The Lodge at Tiburon in Northern California. We have decided to not go to Hawaii for our anniversary in May, (5 1/2 hours on a plane each way with two kids 2 and under...no no no!!!) so this is where we are going instead. Michael found this place by chance on the Internet. It looks amazing and I love San Francisco so we are going to have a blast. I can't wait to go! On top of all the wonderful things Michael got me I also got...the movie Fools Gold, 24 Seasons 1 - 3, $15 Gift Card to Old Navy and a day with my mom all to myself...meals included!! I had such a great Christmas!!! After we finished opening presents at our house we got ready and headed down to my parents house. Since they have vaulted ceilings in their house dad decided to get a 12ft tall Christmas tree it's absolutely gorgeous! Owen ate really good during dinner, but I think his favorite part was the chocolate reindeer at the end. Some friends of ours from church got Jack this bib. I love it!!! Jack and Owen both made out like bandits at Ga-Ga & Pa's. They got personalized step stools that have their names on them and letters come out like puzzle piece. I didn't take a picture of those, but I will later. They both got these personalized growth charts that you hang on the wall. They have places to put pictures in them too. They also got union suits with their names on the bottoms! On top of that GG sent Owen a Wonder Pet toy and Jack a frog that plays music and teaches you different stuff. They were so cute! But of course the wrapping is way more fun to play with. Mommy got some good snuggle time with Jack at the end of the night. Again the boys got to stay up past their bedtime, but they were both great. Jack even slept all through the night which was a super nice present for me! When we got home from Michael's mom and dad's house we put the boys to bed and then started setting up for Christmas morning. I bought Owen an Elmo's Radio Control Roadway (found it at a garage sale for $2) so we set that up and also put out Jack's Busy Ball Popper. In the morning we got up and had breakfast first and then took the boys into the living room to open presents. Michael was trying to show Owen how to work the Roadway, but he just kept trying to get up and take the car off the track. He's understand it more now, but I think Michael and I have been enjoying this present more than Owen. This is the Busy Ball Popper we got for Jack. It's definitely a toy that he will grow into, but Owen is enjoying it right now. We also got Owen this Tugboat. My friend Ellen has one and he just loved it so when I found it brand new at a garage sale for $10 I was so excited. Jack wasn't quite sure what to think of his teddy bear. For Christmas Michael got 4 shirts, Fallout 3 (computer game), Season 2 of The Unit, Bourne Ultimatum and lots of Ghirardelli chocolates. I love this picture of me and the boys. They are precious gifts to me! We spent Christmas Eve at Michael's Mom and Dad's house. I made Taco Soup for everyone for dinner. It was SO yummy! We had a good time hanging out with family. The boys stayed up WAY past their bedtime, but they both did great. Grandpa Martin had to work, but he got home around 7pm so we waited to open presents until then. Paige was so excited this year because she's 4 now and she can eat dairy. She's been horribly allergic to it since she was born, but they started out giving her a little bit each day and she's doing great so they think she's just grown out of it. YAY!!! I couldn't imagine being allergic to dairy! Cooper and Avery are growing up into such handsome young men! This is a self portrait I took...I wasn't even trying to get Michael and Owen in the background it just worked out that way...I mean I'm just talented that way. Owen was having fun rocking in this chair I even caught him checking himself out in the mirror that was behind him. Paige opening her baby doll. Camryn loves to play dress up so this gift was spot on! Jack got an animal parade, but Owen seemed more interested in it than he did. Samantha got a Cabbage Patch Kit named Bridget. Here are our annual Christmas tree pictures. Michael's brother Steve and his family weren't able to come this year because they both had to work until 7pm plus they live in Lacey so it was too far to come that late...especially with all this snow. Here's the house after we got all that snow. It's hard to tell exactly how much we got because it was so windy. The first time it snowed nothing stuck to the roofs because of the wind. But according to the sidewalk in front of the fence we got 9 inches, but I think it was really closer to 11. It was lot that's for sure! Here it is now! Thank goodness Lowe's has a 1 year warranty on there plants. We are pretty sure it's not going to make it since it's only suppose to handle temperatures down to 20 degrees. We didn't bother building a covering for it because we thought it wouldn't get that cold. WRONG!!! After taking Owen out the first time it snowed I checked in his closet just to be sure that he didn't have snow boots and sure enough he did!! I knew my cousin had given me some, but I thought they were WAY to big for him, but they weren't. They were one size to big, but we kept him in his footie pajamas so that took up the extra room. Michael came out in the snow in just his pajamas and normal shoes until I was able to talk some sense into him!!! Owen liked walking in compact snow that was on the road better than the deep snow. Daddy wrote Owen's name for him. Surprisingly Owen didn't try to mess it up! Michael and I both worked at clearing the driveway while Owen kept going over to the snow pile and bring snow back. Thankfully his shovel and stamina was smaller than ours! The snow at our house was really dry so it wasn't very good for making a snowman. This is Michael's second attempt at building one. The first one ended up looking like the glass Mrs. Butterworth jar and Owen karate chopped it's head off. He left this one alone though. I kept trying to get Owen to eat snow, but he would just say, "Noooo", but once I told him it was ice he was hooked! Walking in a Winter Wonderland!